Nozawa Spa, one of the most famous and the oldest hot springs in Japan, would have been discovered by Gyoki, the famous Japanese monk, during Semu Emperor reign (724-748). Since the seignior of Iiyama, Matsudaira constructed a country house during Edo Period and allowed then the people to come to take baths, Nozawa has become a very popular spa resort. Ski practice is also old there because it was introduced in 1912, just one year after its first appearance in Japan. During Nagano Olympic games of 1998, the competition of biathlon was organized there. "Douso-jin" comes from a pagan cult and is considered a god, protector of the village and travellers. 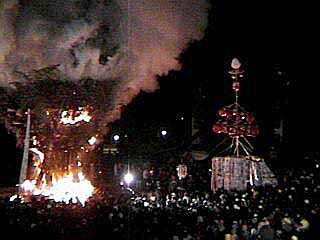 That cult exists everywhere in Japan but the particularity of the festival at Nozawa village consists in a battle of fire: one group tries to put fire on a Douso-jin shrine while another forbids to do so. The origin of the festival is unknown but it has been already practised in the early 19th century. Nowadays, the festival takes place on January 15th of each year (new year in the old calendar).